Performers include: Elizabeth Lail, Penn Badgley, Shay Mitchell, Nicole Kang, Kathryn Gallagher, Victoria Cartagena, Luca Padovan, Zach Cherry, Daniel Cosgrove, Lou Taylor Pucci, and John Stamos. 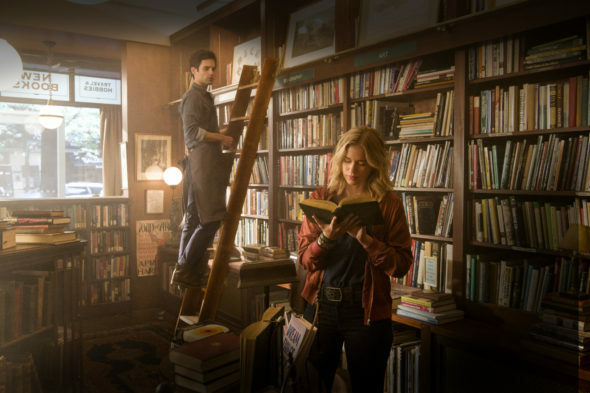 Based on the Caroline Kepnes novel of the same name, the You TV show comes from creators Greg Berlanti and Sera Gamble. Although the network bills it as a 21 Century love story, this thriller is truly a twisted tale of frightful fixation. Unfolding in New York City, the psychological drama centers on bookstore manager Joe Goldberg (Badgley) and aspiring writer and grad student Guinevere Beck (Lail). Beck, as she likes to be called, is struggling with a heavy work and course-load. Unfortunately, her friends are not even much emotional help, since they don’t seem to get or support her. She also can’t shake her boyfriend of sorts, Benji (Pucci), who treats her somewhere between a booty-call and an afterthought. Meanwhile, Joe appears to be bright and compassionate, with a keen eye for detail. When he meets Beck, he is instantly smitten and searches for more about her online. Despite the fact that he looks out for a neglected neighborhood boy, Paco (Padovan), as Joe narrates the pilot, it soon becomes clear that this seemingly caring romantic is a dark soul prone to obsession and violence. Were someone to ask Joe, “What would you do for love?” his answer could well be murder. There is little risk of blaming his stalking on some lack of confidence, since it escalates quickly to alarming levels. He engages in voyeurism and even enters Beck’s apartment under false pretenses. By the time Joe gains access to her electronic devices, Beck is in too deep, even though she has spent but minutes chatting to him at the bookshop. Joe will have Beck at all costs. To that end, he sets out to remove everything — and everyone — standing in his way. What do you think? Do you like the You TV series? Should this TV show be cancelled or renewed for another season? Amazing TV Show. Please bring back YOU! Great show! Binged it, of course. Creepy when you see parallels with real life situations. PLEASE renew this show! It’s so addicting and entertaining. Love it. Love this show it’s a little different. Love this show. Keep it on the air!! I lOVE THIS SHOW,,, IT IS DIFFERENT, EXCITING, THRILLING, SUSPENSEFUL. THE ACTING IS GREAT. PLEASE KEEP IT ON THE AIR. Love this show. Finally something to watch with a real story line and not a simple non-funny sitcom. Keep it going. It is 2 books and Joe’s story should be told. He is a complex character. I like the TV show. I really love this show. It’s like nothing on TV. While I understand the thinking behind the idea that some scenes are needed for the viewers to understand the psychotic nature of the character, it really isn’t necessary – a hint would do for regular TV. The acting in this pilot is fantastic, love the cast. Sera is adorable & Greg reminds me of a young Matt Bomer from White Collar. HAD ME ON THE EDGE OF MY SEAT, SCARED , I WANT JOE AND BECK’S DATE TO GO WELL TONIGHT !!!! I CAN’T WAIT FOR TONIGHT’S EPISODE !!! PLEASE DO NOT CANCEL THIS SHOW !! !